You are hereHome>Portfolio>Books>¡Y luego dicen que la escuela pública no funciona! 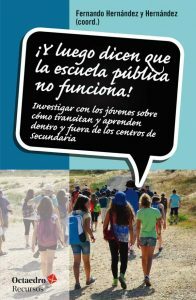 What does an ethnographic study carried out with secondary school students reveal about how they travel through their learning inside and outside the educational centers? How does ethnographic research contribute to the understanding of the learning contexts of young people, some mediated by digital technologies? What bridges can be established between the university and schools to expand our understanding of young people’s ways of learning? How can you learn from inquiry projects? What contributions are derived from this publication to rethink the meaning of secondary education and to be able to get all young people to find their place to learn meaningfully? It is these and other issues that we explore in collaboration with a group of young people.